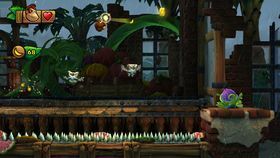 Jammin' Jams is the second hidden level of Juicy Jungle, the fifth world in Donkey Kong Country: Tropical Freeze. It is unlocked after the players clear Panicky Paddles, the fourth level of the said world. The stage takes place before and during a thunderstorm, as clouds oppress the skies and lightning flashes far away. 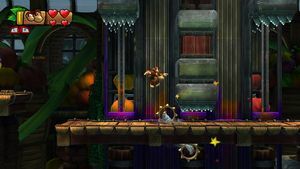 As the Kongs venture through the whole jungle drama, they encounter platforms and spiky machinery that function on a rhythmical basis, and the players must time their actions so the characters could pass by the obstacles without harm. 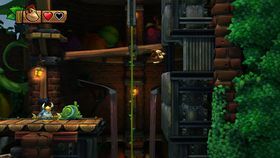 It should be noted that the stage takes place in what looks like a fruit-mashing factory, as the large, timbered mechanical pillars with spikes on their bottom, mentioned before, execute the task of crushing the fruit that stack up on a track in the background. 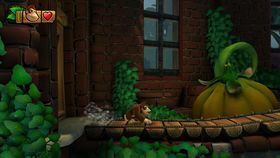 A portion of their spiked surfaces widens to overshadow the Kongs' path; as such, they can potentially squish them with their sharp velocity and spikes. However, as stated before, the dangerous machinery is regulated to function at a specific pace, and can be avoided by remembering its patterns of movement. Over the course of the stage, Snowmads like Tuff Tucks, Archies, Painguin Tucks, and Hootzes, as well as indigenous creatures like Bouncelisks and Toucan'ts can be found. Lemmingtons are very common too, and they can usually be seen revolving with their sticky wheels around platforms; these enemies are short enough to pass under the spiked machinery. The time limit to win the Gold Medal in this level's Time Attack mode is 01:45.00. The stage begins in front of a huge wooden door, standing between colossal brick walls camouflaged with ivy. The path is trod with wooden planks and travels by an enormous terrestrial fruit. The path discontinues with a couple of spiked bottom pits. Over the pits, two platform formations advance from and retract in the immediate background, forming temporary bridges for the characters. Between the pits, there is a structure growing a Flower Bulb, which contains a Banana Coin. An Archy standing past the timed platform area and behind a small whitewashed structure aims to shoot anyone in sight. So does another Archy found further, past a pit bridged with timed platforms. A Buddy Barrel is located on top of the aforementioned whitewashed structure, and a Banana Coin takes its cover. A large chasm yawns at the ledge of the road, but a series of Barrel Cannons and Auto Fire Barrels float atop. Their trajectory is marked by bananas and a single Hootz. The shooting barrels are followed by a hollow entrance in the factory, marked in the background with wooden girders and a roof of tin. The path continues, starting with a small raised platform on which a Flower Bulb containing a Banana Bunch stands. A little down the path, a Bouncelisk marches under a group of reeling bananas. The lizard's road is separated by what follows next with spiky floor, from which a long wooden path, trembled by three giant mechanical pillars, commences. In between the pillars, placed vertically, are rows of bananas. On a side note, the factory's ramparts rise the ceiling high up and are built with brick material, being furnished with long gothic windows as well. DK bounces on some Hootzes and collects items. Past the pillar area, several platforms are disposed negligently above a long pit with fruit stabbed by vertical thorns. Between the two elements, a bridge of advancing/retracting wooden platforms is actioned by obscure works found in line at the bottom. The stationary platforms are infested with Flower Bulbs, bananas, an Archy, a Tuff Tucks, and a Toucan't, under which there is an Item Handle covering a Banana Coin. Above a pit that follows is a tower containing cogwheels that action wooden platforms, useful for ascending to a higher place. This place is lifted by a dilapidated structure, and comprises wooden floor guarded by a Painguin Tucks. The floor also contains a Spinning Platform, with a Banana Coin underneath, as well as a timed bridge above a spiked surface. Above the right-side edge of the floor is a banana bunch. The last obstacle before the first checkpoint booth is a pit that parts its low-constructed platform from the past road. Enormous structures collapse to pieces. Beyond another pit, the road continues into a highly mechanized area, featuring fruit-mashing pillars, as well as Lemmingtons that march the path, above and underneath it. A banana bunches and Banana Coins can be found within the spaces between pillars. A narrow pit ends the mechanized area. A piece of solid ground, with a Buddy Barrel on it, prepares players for several cog-actioned wooden platforms that build up multiple paths above some spiked floor. A Hootz ascends and descends near the last platforms, margining the area. Just before the exit to the outside environment, a vertical wooden track drops spiky red fruit on the remaining safe floor. Moreover, a path with a Toucan't and a Flower Bulb overshadows a road of timed platforms that roof the spiked floor underneath. Throughout the area, several Banana Coins and banana bunches can be collected by bouncing on an array of Hootzes. At the end of the area, a Flower Bulb containing bananas, as well as several Barrel Cannons over a wide abyss, can be found. A very high brick wall, moving up and down, follows. It displays patches of spikes, between which is a rather big circular button. The heroes must get shot by the Barrel Cannon into the button in order to collapse the wall in front of them, as well as the surrounding ramparts, and proceed. 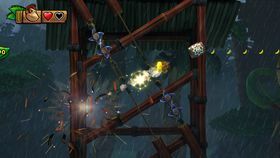 Afterwards, the characters get launched in a series of Barrel Cannons, and must avoid sharp blades moved from side to side by rusty chains and pullets. 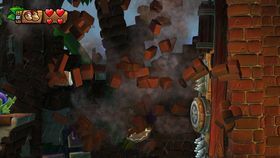 Finally, a moving Barrel Cannon can launch the Kongs high up in the air, so they could reach the top of a bricked structure, which hides a handful of bananas through an Item Handle. At the left of this structure, several advancing/retracting platforms form an additional path, but from the right side on there is a road with a Tuff Tucks and a Papa Painguin. What is more, there is a Flower Bulb. Further opens up a very deep passage heading down. A lengthy vine hangs very low and drives the player into a series of crushing thorn pillars that make up the main obstacle in the tunnel, along a spiky floor at the bottom. The tunnel is variegated with several Banana Coins and banana bunches, but it ends with a path that leads into an area with several ornamental girders and a checkpoint booth. DK gets shot between two sets of rotating blades. What looks like a stairway made of advancing/retracting platforms is soared by a Hootz and ascends towards a ceiling covered with climbing grass. The way through the level gets more complex, as it hosts mechanized platforms as the ones presented hitherto, Lemmingtons revolving around timbered structures, and diverse owl species that include Hootz and a Puffton. After the area has been passed through the help of a surface covered in climbing grass, there is a long platform walked over by a Bouncelisk, above which six banana bunches float. Multiple Barrel Cannons lead the heroes into a series of perilous blades, moved by pulleys in various lines and directions. They must be dodged at all costs, but the path is also made up of items, including an ascending Extra Life Balloon that can be snatched at the right moment. Lastly, a self-destructing Auto Fire Barrel launches the characters on the ledge of a road, on which a checkpoint booth is set. Further to the right opens a broad passage conked by multiple crushing pillars. One of them is unfunctional, but dangerous nevertheless, due to its spikes. The road hides a vast amount of objects, connected with Item Handles found on the floor. Near the edge of the road, there is a patrolling Painguin Tucks. A high dead end wall rises up, but a pounding post helps send shocks into this wall and its surrounding ramparts and collapse them to reveal the level's continuation in the background. A Barrel Cannon pops out after the post has been used to its extent and launches the characters onto a wooden platform, supported by a whitewashed structure. (Even though the platform is in the background, the camera zooms in the respective area after the Kongs land there.) The final section of the level prevails with a row of self-destructing Barrel Cannons, slowly conveyed from somewhere beyond the area. Each of them gets destroyed by the spiky red fruit that fall from a vertical woody track, when they reach a certain spot. The Kongs must launch themselvesfrom cannon to cannon in order to proceed towards the Slot Machine Barrel, also minding the spiky fruit that break their cannons and a lone Hootz that flies over them. K: This letter is located above the first Tuff Tucks encountered in the level. For further reference, it floats to the far right of a high platform with a Flower Bulb. O: Some distance after the area with many crushing pillars and Lemmingtons, the letter "O" is at the right side of a Hootz moving up and down, and also under a wooden track with spiky fruit. N: After getting launched between groups of blades by a series of Barrel Cannons, a structure built higher up is extended with two formations of moving platforms. From right to left, over the second formation, floats the letter "N". G: This letter is seen over a series of conveyed Barrel Cannons, soared by a Hootz. In other words, it is located near the end of the level. DK swings from a long vine and prepares to enter the passage to the third Puzzle Piece. Over the first Bouncelisk of the level, there are multiple bananas reeling in a circular pattern. They all have to be collected in order that the first Puzzle Piece gets revealed. Going left from the place above which the letter "K" is found, there is a wooden platform rised higher and containing a Flower Bulb. The player can reach this platform by bouncing on the Tuff Tucks under the letter "K" and heading left. Further to the left, players can notice a small patch of climbing grass germinated on the side of a squishing pillar. The grass can be hanged on to and clambered, leading into a bonus area. Here, the Kongs must launch themselves from Barrel Cannons into banana bunches and collect them all within a time limit of 30 seconds to receive the second Puzzle Piece. After the path walked over by a Tuff Tucks and a Papa Painguin, near the lengthy vine that leads into a deep tunnel, a passage is hidden from the sight of players by a piece of tin. The passage leads into a bonus area, where the Kongs have to collect all bananas in a set amount of 30 seconds time. They would need to use the spring platforms to reach the reeling bananas. The timer stops and a Puzzle Piece is revealed after the Kongs have grabbed all of the bananas in the allotted time. Above the only Puffton ever encountered in the level is a broad platform, which a Lemmington circles around. The platform has climbing grass on its bottom, as well as a trail of bananas and a Flower Bulb on its top surface. The ground in front of the bulb has to be pounded in order to make the plant release a Puzzle Piece. At one point, players encounter a heavily mechanized zone with multiple crushing pillars, one of which does not work properly. It is cracked and trembles its works. Down the road, there are Item Handles, with the third of them hiding a Watermelon Fuse Bomb. The object can be thrown at the less functional pillar to destroy it. A Puzzle Piece gets revealed afterwards. DK and Dixie make their way through an area of sharp rotating blades.